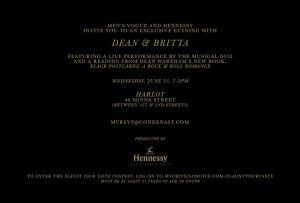 Dean & Britta will be performing on Wednesday 25 June (that's next Wednesday!) between 7 and 9pm at Harlot, 46 Minna Street. The invitation (left) was posted out on Dean & Britta's newsletter - if you wish to attend you need to RSVP to MVRSVP@condenast.com.